Henry Holt and Co., 9780805098815, 288pp. Twelve homicides, three police-involved shootings and the furious hunt for an especially brutal killer--February 2013 was a good month for murder in suburban Washington, D.C.
After gaining unparalleled access to the homicide unit in Prince George's County, which borders the nation's capital, Del Quentin Wilber begins shadowing the talented, often quirky detectives who get the call when a body falls. After a quiet couple of months, all hell breaks loose: suddenly every detective in the squad is scrambling to solve one shooting and stabbing after another. Meanwhile, the entire unit is obsessed with a stone-cold "red ball," a high-profile case involving a seventeen-year-old honor student attacked by a gunman who kicked down the door to her house and shot her in her bed. Murder is the police investigator's ultimate crucible: to solve a killing, a detective must speak for the dead. 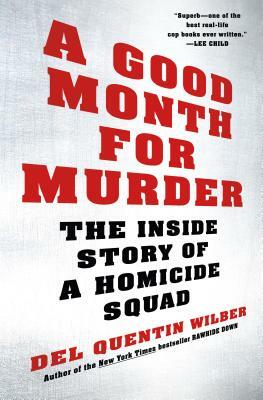 More than any recent book, A Good Month for Murder shows what it takes to succeed when the stakes couldn't possibly be higher. Del Quentin Wilber is the New York Times-bestselling author of Rawhide Down, an account of the attempted assassination of Ronald Reagan. An award-winning reporter who previously worked for The Baltimore Sun and The Washington Post, he now covers the justice department for the Los Angeles Times. He lives in Chevy Chase, Maryland.